What is Carville’s Industrial Parts Track History? Since the foundation of the company in 1928, Carville have been servicing various industrial markets with precision machined and fabricated plastic parts. Starting with Acrylic in the 1930’s, Carville was at the forefront of developing machining techniques to produce display systems, machine parts and optical components for the transport, defence, research and process industries. High Accuracy Diffusion Bonded (HAB) manifolds are an ideal way to incorporate multiple valves, channels and fittings into a single assembly. One example application for Latchways Ltd, is a solution to produce a vacuum attachment solution using a valve manifold for workers to attach safety harnesses to when working on aircraft wings. This is lightweight, compact and reliable system for fall prevention incorporates many safety features for worker protection. Similar to the fluidic manifolds for medical diagnostic equipment, Carville have produced a number of different bespoke solutions for water sampling applications. These water quality testing systems test for a range contaminants, microbiology and concentration levels for many different sources including seawater, drinking water and swimming pools. 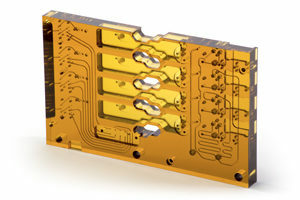 We also produce large, complex assemblies in Acrylic/Plexiglas for water purification systems. 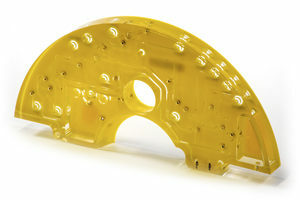 The impressive, glass-like optical properties of Perspex Acrylic or Rohm Plexiglas are perfect for many industrial and research based instruments. 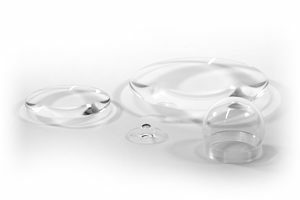 We have produced many CNC machined PMMA lenses and light guides for applications such as high volume automotive displays, submarine lenses, camera covers and food processing equipment. These require very careful heat treatment, machining paths and both vapour and manual polishing to get the correct refractive properties for the individual applications. We work with clients to design testing methods to conduct optical quality assessment at Carville, before assembly into the final customer’s instrument.